Getting together with a partner may be easy, but staying together is anything but. So how do you keep a loving relationship alive, and your sexual intensity fully charged? How do you grow as a partnership, rather than grow apart? HOW Two LOVE sets out with a bold ambition; to offer the tools and guidance you need to solve these problems, turning the practice of love into an art. HOW Two LOVE is a celebration of our relationships, not as a formula, but as a work in progress, messy and complex and wonderful. With a transparency that refreshes, and a lightness that will leave you smiling, internationally respected author and educator Jan Resnick turns his extensive experience of psychotherapy and couples counselling into a series of charmingly recounted stories from his consulting room. He brings together surprisingly connected themes and lessons learned from a career that spans three continents and four decades. Described as “the book that, now in my sixties, I wish I had read in my twenties”, by notable psychiatrist and author Richard A. Chefetz, MD, HOW Two LOVE doesn’t seek to diagnose or judge. It isn’t a textbook reserved for specialists and professionals. Resnick’s audience is far broader. As Psychoanalytic Psychotherapist and author Nancy McWilliams, PhD, wrote, HOW Two LOVE is for “anyone who has ever been in love, wanted to be in love, lost a love, or suffered for love”. The first offering in his Meaningful Living Book Series, HOW Two LOVE is a powerful and transformative guide made for two, a reminder that, in love, every wound, every mistake, and every missed opportunity is an occasion to heal, to grow and to learn. In its pages, Resnick has deftly created a detailed roadmap, revealing how you can avoid the pitfalls that lead to breakdown and emotional injury; while raising the deeper issues of desire, the loving sexuality of a long-term partnership, and, most importantly, what makes love work over time. Jan is an internationally respected author, educator and sought after Psychotherapist and Couples’ Counsellor. 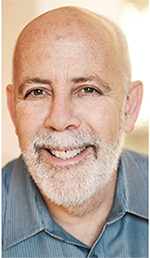 Admitting to his own adventures and misadventures in love and co-sexuality, he has helped hundreds of individuals and couples over nearly four decades of clinical practice. Jan was Founding President of the Psychotherapists and Counsellors’ Association of WA, Director of The Churchill Clinic, a nationally accredited training organization, for 18 years and has been on the Editorial Advisory Panel for the national journal,Psychotherapy in Australia, since 1994. Born and raised in New York, Jan undertook his PhD and professional training in London. He has six adult children and currently resides with his wife, Catherine, in Perth, Western Australia. Information is plentiful and cheap these days, but wisdom is rare and priceless. 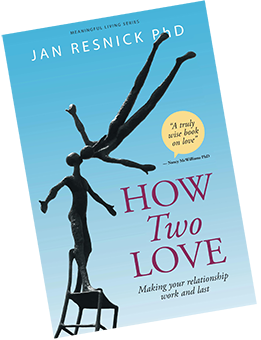 Jan Resnick has written a truly wise book on love. Instead of the glib slogans of self-help gurus or the charmless findings of happiness researchers, he offers profound, modest, witty and useful reflections on the mystery that is love. Only someone with years of experience helping couples in all stages of being together and coming apart could have written a work of this depth and complexity. I recommend it to anyone who has ever been in love, wanted to be in love, lost a love, or suffered for love. Nancy McWilliams, PhD, Graduate School of Applied and Professional Psychology at Rutgers, the State University of New Jersey, Psychoanalytic Psychotherapist and Author. Jan Resnick’s HOW Two LOVE is a joy to read. Both pertinent in topic and highly accessible in style, it rewards its readers with themes and ideas – and very vivid vignettes – that create an immediate sense of recognition and connection while at the same time provoking intriguingly novel perspectives. A thrilling and thought-provoking plunge into the mysteries and possibilities of co-sexuality. Professor Ernesto Spinelli, PhD, Director of ES Associates, London, Fellow of the British Psychological Society, Existential Psychotherapist and Author. Jan Resnick has written the book that now in my sixties I wish I had read in my twenties, or earlier, if I could then have sat still long enough to learn from his life and his career. Pick up this book, sit down, read it, and talk with Jan about your life. You’ll enjoy the conversation! Richard A. Chefetz, MD. Psychiatrist in Washington, D.C., Past President of the International Society for the Study of Trauma and Dissociation (2002-3), and author.